We need to fully understand the essence of Giftedness so we can identify and support the full continuum of our gifted population. This understanding is especially important in identifying and fulfilling the developmental and educational needs of our highly and profoundly gifted. 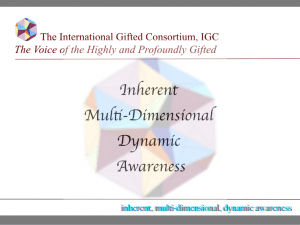 This understanding will allow us to 1) create targeted programs to nurture the unique social, emotional, physical, cognitive and altruistic development of our gifted, highly gifted and profoundly gifted youth 2) provide fitting educational opportunities to meet their different needs. To do so, we need to identify Giftedness through a variety of metrics that consider and capture the authentic characteristics and developmental milestones of the dynamic individual. Students, children, or youth who give evidence of high achievement capability in areas such as intellectual, creative, artistic, or leadership capacity, or in specific academic fields, and who need services and activities not ordinarily provided by the school in order to fully develop those capabilities. Do our formal definitions of Giftedness match the humanistic characteristics, behaviors and needs of our gifted youth? 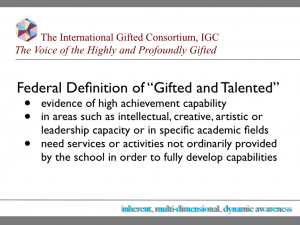 Do our formal definitions of Giftedness allow for proper identification of our gifted youth? 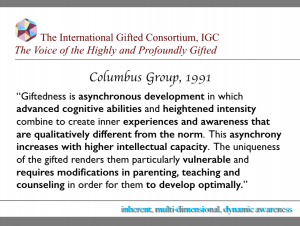 Do our formal definitions of Giftedness allow for proper developmental and educational support of our gifted youth?